No coffee outside for us today! 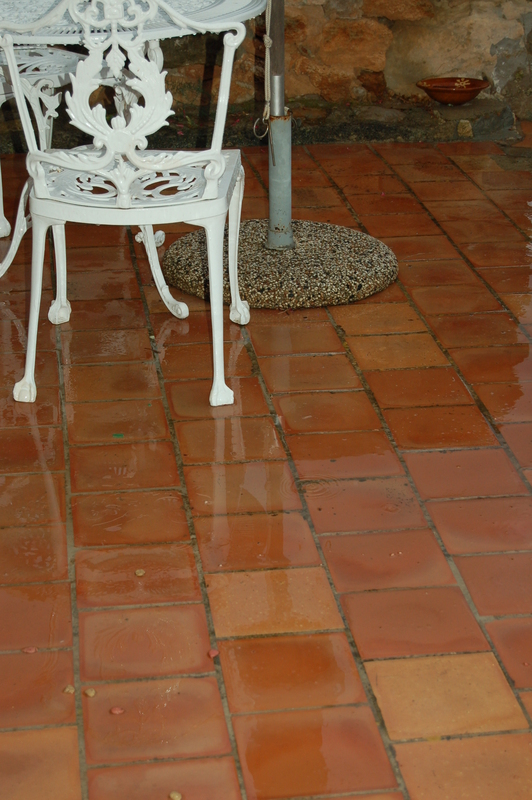 Tiles have had a much-needed wash . . .
Another crack of thunder booms across the valley, rattling every pane of glass in our finca in rural Mallorca. We’re in the grip of a much-needed summer storm that’s been rumbling on since early this morning. And, as a result, we’re without electricity. Whenever there’s a storm overhead, we switch off our solar power system – not wanting a repetition of the occasion when a serious storm blew out our invertor. The very same invertor we’d had installed just a few weeks before – we could have had an exotic holiday for what it cost. The original system invertor had been a rather Heath Robinson affair that had suddenly gone into spontaneous combustion mode. Thankfully, our house insurance covered the replacement of the storm-struck invertor, but we wouldn’t want to risk having to file a second claim. Taking the advice of Toni, our man-with-the-toolbox, we switch off all the power when there’s a storm close by – even if it’s in the middle of the night. When storms are forecast, The Boss places his ‘storm kit’ – umbrella, coat, keys to the power house, and torch – by the back door, ready to leap out of bed at the first flash of lightning and head down the field to the power house. Everything has been switched off since early this morning and it’s a bit like the way we lived here for eight months, before we had electricity. With the shutters closed against the rain, we feel like a couple of moles. Candles and camping lights come into play, but we’re once again temporarily without a phone or Internet connection, and I’m typing this onto a Word document, to transfer onto WordPress when normality is restored. It’s amazing how the limited battery life of a laptop can focus the mind . . . There have already been a couple of storms in other parts of Mallorca this summer, but they’ve passed us by. Despite the inconvenience of having no electricity for the duration of this one, we’re grateful for the rain – having had no more than what the locals call cuatro gotas (literally, four drops) at a time since early June. The previously parched plants in the garden are already looking quite perky – unlike the battery level on this laptop. A good excuse to go boil up a saucepan of water on the gas stove and make some coffee . . .